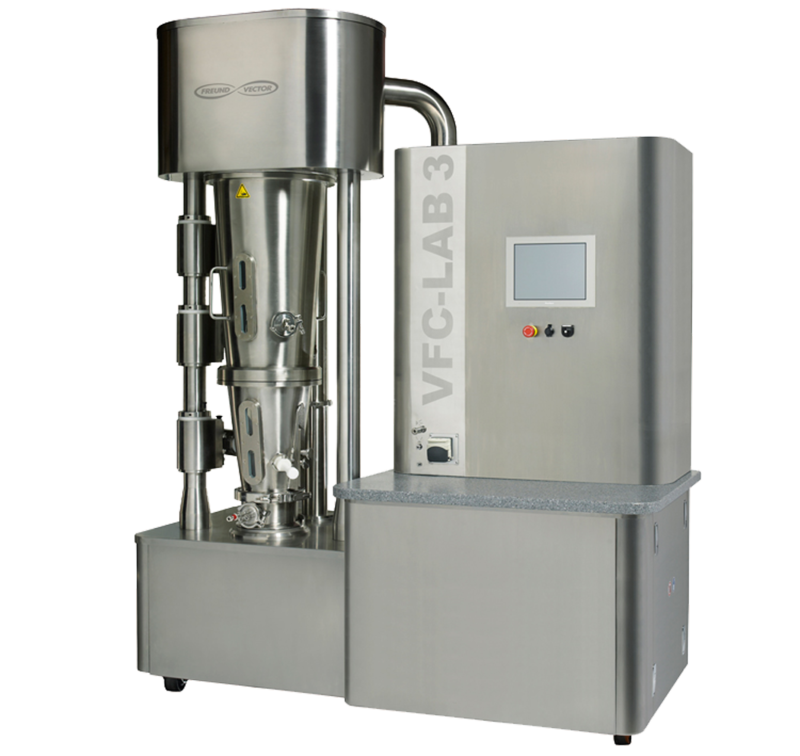 Granurex is a processing insert that will fit within a VFC Flo-Coater fluid bed system. 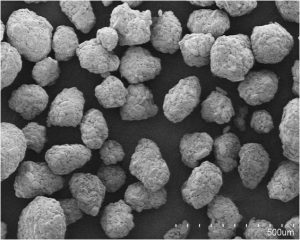 Pellet Formation: Spherical granulation of powders into spherical granules/pellets (as low as 50 micron). Dry Powder Layering: Rapidly increasing size of pellet by directly applying a powder. The powder could be an API (Active Pharmaceutical Ingredient), a controlled release polymer, or an excipient. Watch the Granurex Spherical Granulation Processing Video by clicking on this link. 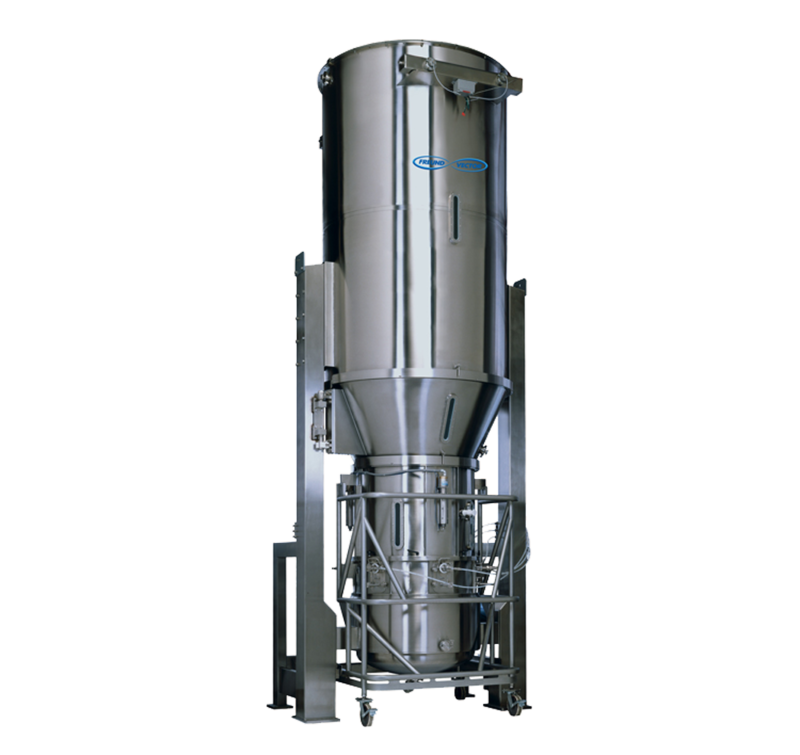 A powder feed system can be integrated into the Granurex process, which greatly increases the rate of pellet formation. Watch the Granurex Powder Coating Processing Video by clicking on this link. Historically, rotor-based processors were limited on drying capacity. Freund-Vector designed the Drying Accelerator Duct within the Granurex processor. This greatly reduces process time and increases yield. In this picture, the spherical granulation process is complete and the product is getting dried via the Drying Accelerator Duct. Granules produced by the Granurex® rotor processor are dense and spherical in shape. 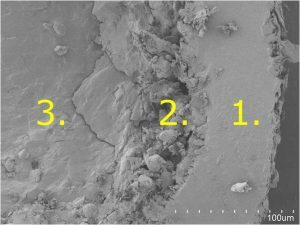 The pictures and graphs shown below demonstrate how the Granurex® rotor processes Ciprofloxacin from a 7µm poorly flowing powder to 200µm granules with excellent flow characteristics. After 30 minutes of processing within a Granurex processor, Ibuprofen pellets were generated and shown below. Ending product characteristics: 250 micron spherical pellets, 0.59 g/cc density, with very good flow properties. Using Granurex, 250 micron (d50) ibuprofen pellets were formed within 30 minutes. Using a powder feed system, pellets can be dramatically increased in size in a short period of time. The powder applied can be the API, allowing for very heavy loading of active drug onto an existing pellet. In the picture below, the goal was to form pellets with an 80% drug loading with 97% yeild. The API material dispensed through the powder feed system was micronized Flurbiprofen. Within a 2 hour period inside the Granurex®, the 80% goal was achieved representing in a 400% increase over the original starting sugar pellet. An aqueous binding solution was used. With a Granurex processor, polymer coatings can be applied without the use of organic solvents. 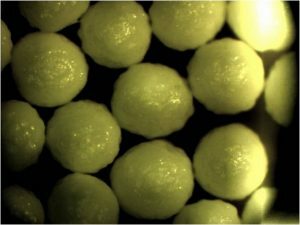 Using commercially available polymers, such as Dow’s ETHOCEL HP®, a film coating can be produced onto a pellet (perhaps formed from the previous case studies). A plasticizer solution is applied at the same time the dry polymer is being introduced inside the Granurex chamber. In the case study below, acetaminophen beads were coated with ETHOCEL HP® to produce a time-released coating. No solvents were used during this process. A pellet with ETHOCEL HP coating applied. 1. ETHOCEL HP coating; 2. API layer; 3. Starting Core. Visit Dow’s website showing ETHOCEL HP by clicking on this link.